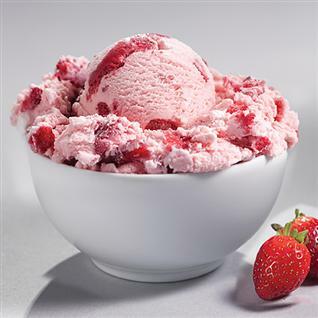 Strawberry Ice-Cream brings back nostalgic memories of my child-hood, when my mother would serve this up in a Sundae Boat as a treat, with chocolate sauce and wafers. Add the strawberry pulp to the custard and sugar. Fold in the half-whipped cream, and add a few drops of cochineal if necessary. Freeze, and serve with lightly whipped cream and fresh strawberries. Add a drizzle of chocolate sauce if desired.